The client wanted a 2500-square-foot house with an abundance of windows for viewing the nature on Shem Creek. That request presented two challenges: (1) The best view of the creek to the west, where the sun would bake the house on summer afternoons, and (2) the structure would have to withstand 150-mph hurricane winds and accompanying debris. The program called for a large living room and kitchen, two bedrooms, a guest room, a workshop, a large screened porch, and a 75-foot lap pool. The house treads lightly on its lush site and evokes the feeling of living outdoors. The long, one-room-deep floor plan gives each room windows and porches overlooking Shem Creek. Bedrooms are located on opposite ends of the central, loft-like living/dining/kitchen area, beneath a single shed roof. The carport is dramatically cantilevered. Operable vents provide natural cross-ventilation and lighting. Approaching the house under a canopy of moss-draped live oaks and up a gentle ramp, the view of the marsh beyond the house appears like an element in a Japanese painting. A large glass wall fronts the southwest side of the house. 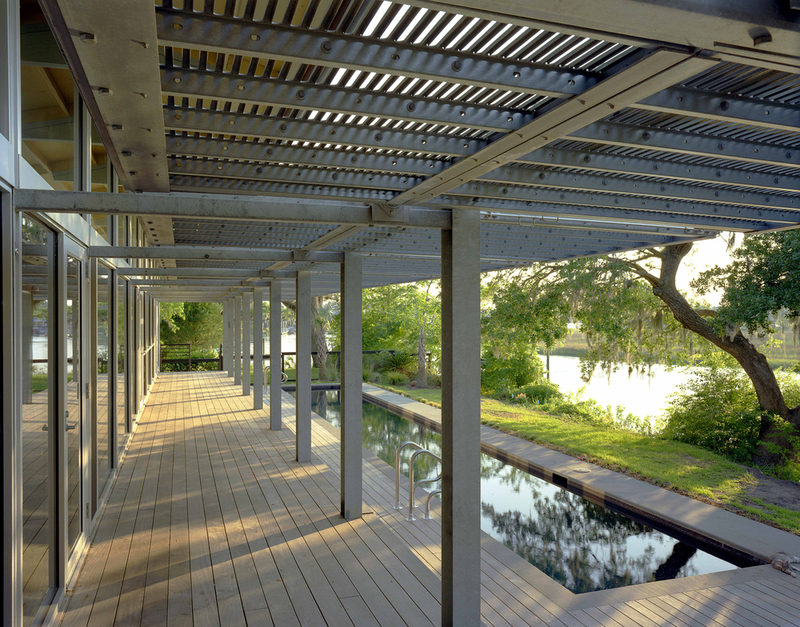 A series of 10 hand-fabricated metal screens hinged above the porch protects this vulnerable face from summer sun and extreme weather, while allowing cooling breezes into the house. The panels can protect the house during any season. In their horizontal (open) position, they shade the house. Closed, they create a shaded, protected porch. The 800-pound screens were designed to allow an individual to lift and balance them easily as they are moved from one position to another.